Check out these books and more in the church library! We now have the entire 8-volume set of The Wild Brothers Adventures in Southeast Asia thanks to a generous donor. This is a real missionary and homeschooling family in the South Seas somewhere. There’s a mom, a dad and 4 brothers who want to explore EVERYTHING. The four sons of Mike and Libby Wild are ready to set sail on a WILD journey. Their destination? Home! Months of meticulous planning and careful building are over. The Wild family is now ready to start their long and danger-riddled voyage from New Guinea to the USA on their handcrafted deep-sea canoe! Solar panels have been added to keep the boys’ computers and video cameras energized. Excitement fills the air as they anticipate the breathtaking sights and new discoveries that lay ahead. However, an unexpected impediment suddenly stands in their way. What will God do? How will they respond? Climb aboard the big Polynesian catamaran for an inspiring family adventure! Our 2018 Reading Club will take place July 15 th – August 19 th. 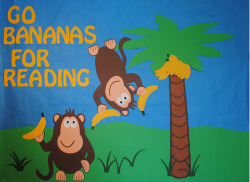 Our motto for this year is a jungle theme: Don’t monkey around this summer; go bananas for reading! Bananas will replace stars on the bulletin board in the library and anywhere else we want to put them. I do need someone artistic to draw a banana tree with jungle type features to hang our bananas on as reading goals are reached. Anyone artistic out there? This year, I want to assist those readers who want to read more challenging books instead of a quantity of smaller books. Still working out the details on how everything is to work. I will put out the call for helpers in my next blogpost. We now have a laptop that will allow people to search our data base through Webopac, our on-line catalog. We will have it open, and on the table after services on Sundays. After mulling it over, and over, I have decided to keep our fine structure in place for overdue books. It’s not much (.50 per book max for children, and 1.00 per book for adults). Special consideration will be granted on a case by case basis such as illness, travel, disaster or the closure of the library for some reason. I don’t personally like fines, but I do come down strongly on getting the books returned. Fine money (paid into our pink piggy or our purple elephant) buys candy for the candy bowl, and special needs for displays that make the library look pretty. Anyway, thought you’d like to know my thoughts on this issue. Any questions, please see me.